This unique and beautiful key chain will allow you to show your passion for spreading Alzheimer's awareness in an interesting way. This would make a fabulous awareness key chain gift for your walk team for your next Alzheimer's walk. 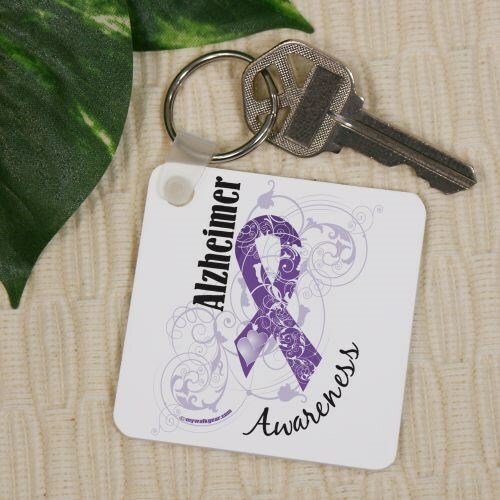 This Alzheimer's Awareness Key Chain measures 2¼" x 2¼" and is a 1/8" thick. Each Key Chain is made of fiber glass reinforced plastic and includes a key ring. Additional Info Our awareness key chains make beautiful everyday accessories that you can carry around to spread the word about the causes nearest to your heart. This Alzheimer's ribbon key chain will touch anyone who works to make others aware of this debilitating disease. Please also see our Screw Alzheimer's Disease Key Chain!